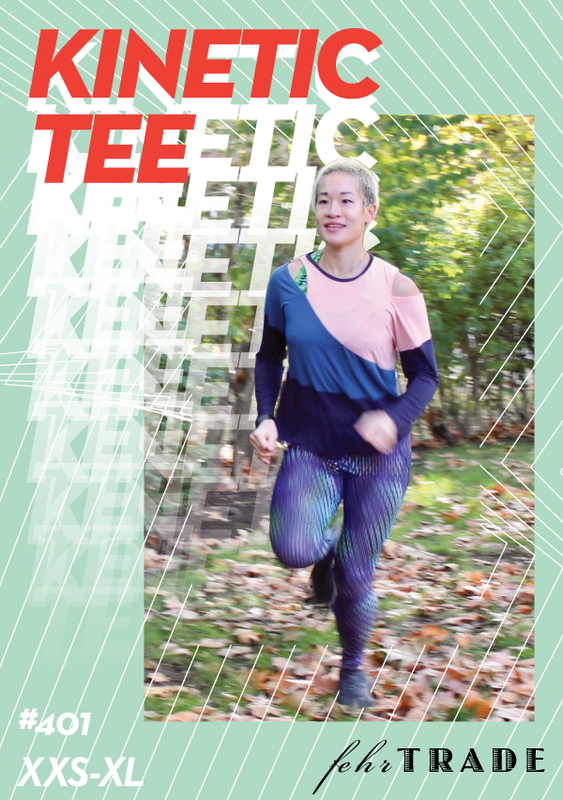 Please welcome our newest sewing pattern - the Kinetic Tee! This one has been so much fun to develop and draft - it's an asymmetric tee but due to some (ahem) clever drafting, it's quick to cut out AND to sew up, and feels really great and comfortable to move in, too. Move in a workout tee that really sets you apart from the team! This loose fitting asymmetric tee has plenty of interesting seaming in the front and back with slash openings at the left shoulder and right front clavicle. Choose from either a cut-on short sleeve, or dropped shoulder long sleeve in twisted or straight options. You all loved the looser fit of the Knot-Maste Yoga Set so this is another great workout option for those of you who prefer your tops looser fitting. It pairs perfectly with any of our close fitting leggings, capris, and shorts, giving you loads of great outfit options for all year round. 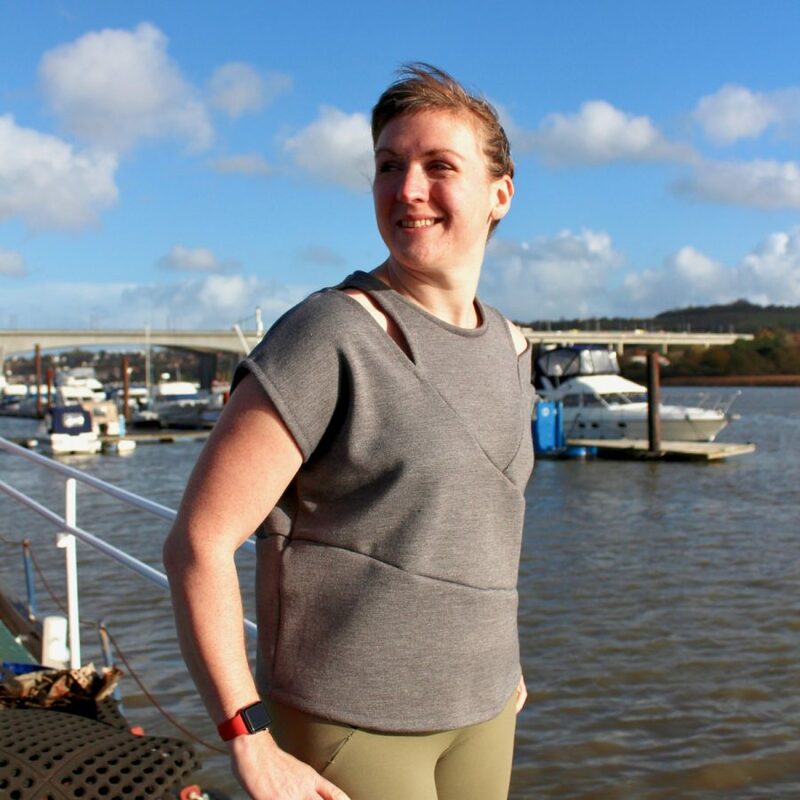 There are three different sleeve options – you can choose to make it short sleeve by just using the integral cut-on sleeve (as seen in grey wool above), or you can choose from two long sleeve, drop shoulder options. 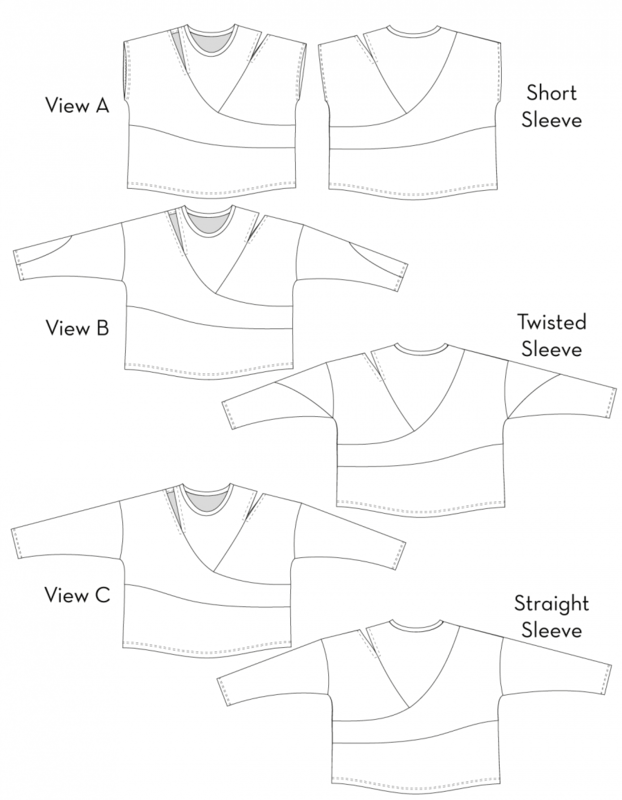 View B uses a unique twisted sleeve with the sleeve seam wrapping around from the underarm to top centre wrist (as seen in green bamboo above), or View C uses a more standard sleeve shape (seen in colourblocked bamboo above). 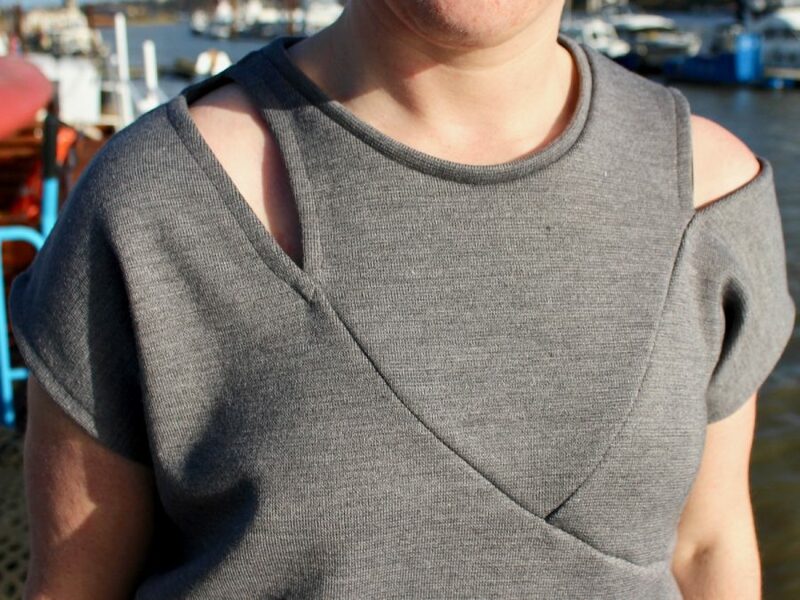 The opening slashes are neatly faced and topstitched, but if you’re not keen on showing skin, I’ve included instructions for making a modest version of this top, too! 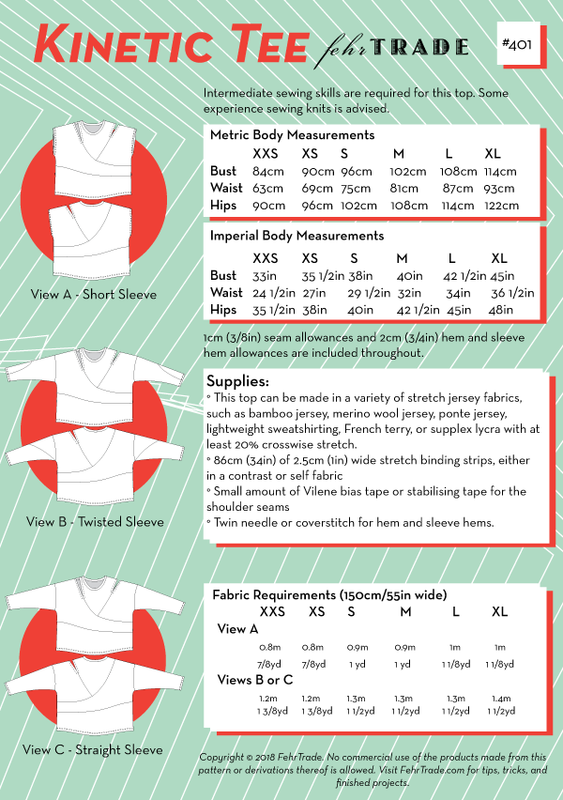 As with all my patterns, the Kinetic Tee comes in a full XXS-XL size range, complete with fully illustrated instructions and a “Common Fit Alterations Section” to help you adjust the pattern pieces. It’s available in both Print-at-Home (compatible with both US & A4 printers) and two Copy Shop versions (one sized for A0 paper and another for 36in wide printers found at reprographics shops to give you the most economic layouts! ), and all the pattern files are layered so that you can just print off the size (or sizes) you need. And to celebrate the release AND FehrTrade Patterns’ upcoming FIFTH birthday (how did that happen?! ), you can treat yourself to a hefty 20% off all our sewing patterns by using the code KINETICFUN at shop.fehrtrade.com til 29 November. Paypal users, take note that you must go quite far through the checkout process before the discount box appears. I’ll be introducing you to my newest athlete model, Cynthia, next week, so stay tuned! Separator image Posted in Gallery, Inspiration and tagged with exercise, fehr-trade-patterns, kinetic-tee, knits, top. Wow! Even though I don’t work out (bad bad me), I adore this pattern and will be placing my order as soon as the dogs have gotten off my lap and I can get my wallet 🙂 . Perfect for staying cool with coverage on hot summer days as well as working out. Such an interesting pattern. LOVE IT.